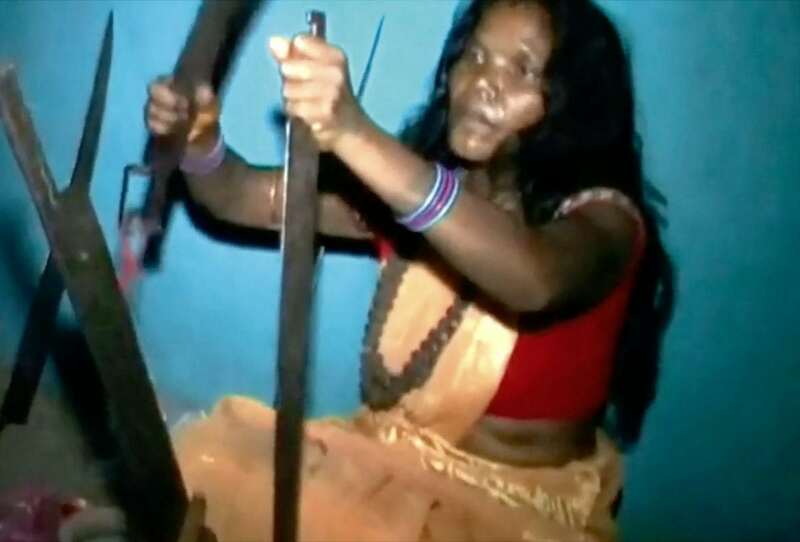 Hardly cutting edge: this is the bizarre way a female tribal ‘doctor’ treats patients in India – with a four foot-long SWORD. The charlatan, who goes by the name Phuleshwari, uses the tip of the blade to put pressure on different parts of the body, including the eyes. These graphic pictures show her inserting the point right into the eye socket of a woman – without drawing blood. Crowds flock to see the sword woman who practices on Mondays and Thursdays in the remote village of Podi in Chhatisgarh in Central India. Phuleshwari said: “I have been treating people at sword point for the past 25 years. “I have cured for ailments like tuberculosis, heat boils, pains in various parts of the body, including the eyes. The pictures show Phuleswari starting her day with a prayer and wildly shaking her head as if getting possessed by some divine power, and then picking up her sword. She then puts pressure on distinct nerve points on the body with the tip of the sword. She thrusts the tip of the sword inside the eye sockets of a woman – whose mother claimed she was cured of her ailment. The sword woman says her patients do not get injured or cut in any way and there is no bleeding. No social organisation or government agencies have raised any objection to her method of treatment so far.